I created and stitched the piece as part of my Level II Certification work. The piece won Best of Show at the 1986 Smocking Arts Guild of America’s Annual Convention. It was featured in “The Book of Smocking” by Diana Keay and “Embroidery with Beads” by Angela Thompson, both needleartists from England. The actual stitched piece is 4-3/4″ x 7-3/4″, but matted and framed is 10″ x 13″. The inspiration for the piece was tiny shells that I collected on a family vacation in Hilton Head, SC. For the piece I pleated two layers of silk together. The top layer of silk is heavier, duller, and a lighter value of turquoise while the bottom layer is a lighter weight, shinier silk and a darker value of turquoise. The cretan stitch was used to manipulate the pleats and to create the effect of waves. 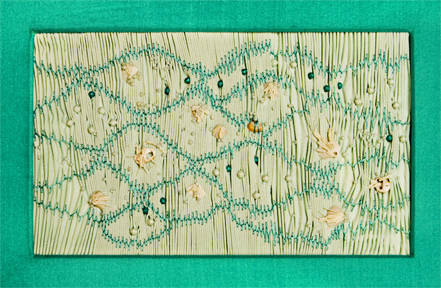 Shells were incorporated in the waves with free needleweaving. Pearlized seed beads sewn in the piece look like tiny bubbles (in the water). In addition, an awl was used to create holes and bring through larger beads covered with the bottom, darker layer of silk fabric. These were to represent yet other types of ‘bubbles’ on the ocean’s surface. Silk threads were used for the stitching.